Is this cable universal for any brand headunit? Could you point me to where you got it? Sorry for being such a newbie on all this. I would look for a radio that had everything required to install it. If its a quality package it will come with everything required to install the radio. My Seicane for instance had everything needed to install it. I bought extras like the backup camera and some things but it had everything in the box needed to install the radio and make it work. There are two versions of the 6m extension cable. One has quadlock on both ends female/male connections at each ends respectively. These might not work as some radios have different pin locations but all quadlock connecting to the car is the same. The other verison has 20-pin on both ends and this works one most radios even if the pin outs are different because in the end you are just extending the wires in between the connections. For all we know... they ALL come with the extension harness from the manufacturer and then the resellers pull them out of the box to charge extra for them. I don't think I've installed a different radio in a car since my '65 Ford Custom 500, so to say I'm trying to catch up on stuff is a bit of an understatement! If I run a long cable that connects to the BMW radio connection in the back and has an ISO connection behind the dash, then I can install most any modern radio. I'm not an audiophile, and in fact, I probably listen to AM radio more than anything else. Hence why I've always been satisfied with whatever radio came in my cars. So... can I toss any cheap ol' radio in there for now and plug it into my newly run cable and expect it to at least play AM/FM? If I do something like this, I could then decide to buy an nice Android unit sometime down the road and it would be essentially plug/play since the cable would already be in place. Am I understanding all this correctly? I really appreciate everyone's help and patience with my stereo ignorance. Last edited by Attacking Mid; 03-22-2019 at 11:34 AM. That will connect at the back of the vehicle. Would you then extend it to the front and terminate in in a female BMW 40 pin. Something like this but minus the older round pin connectors. That would allow you to connect a short ISO male BMW 40 pin to any aftermarket radio harness behind the dash. Or you could forgo the additional harness and wire the long extension directly to the aftermarket radio. I think that is what you were describing in your previous post but was clarifying. 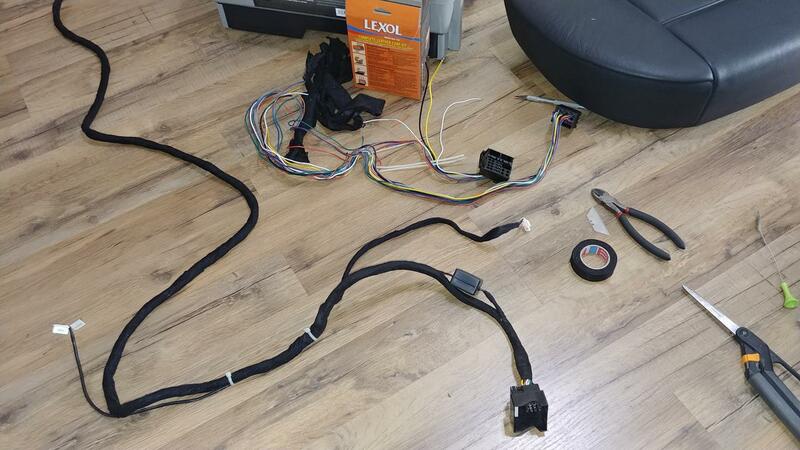 Is something plugged into the BMW 40 pin connector from the Android unit, or do the supplied cables include the 40 pin connector simply to preserve the ability to run a BMW radio in the future? Or am I missing something entirely? Actually, I guess they convert from ISO to 40 pin out of the headunit because some X5's have every connection in the front (basic business radio). In mine with the connections at the back, the long cables that come with the android units have to have a 40 pin to accomodate the fact that the wires comingout of the unit have been converted to 40 pin. Can I skip the ISO-40 pin adapter and just run my long cable from the back terminating in an ISO connectore that I plug into the radio directly? In the below picture, it looks like I would lose CAN Bus connectivity, but do I need that if I have IBus connectivity? Last edited by Attacking Mid; 03-22-2019 at 11:57 AM. Beware. 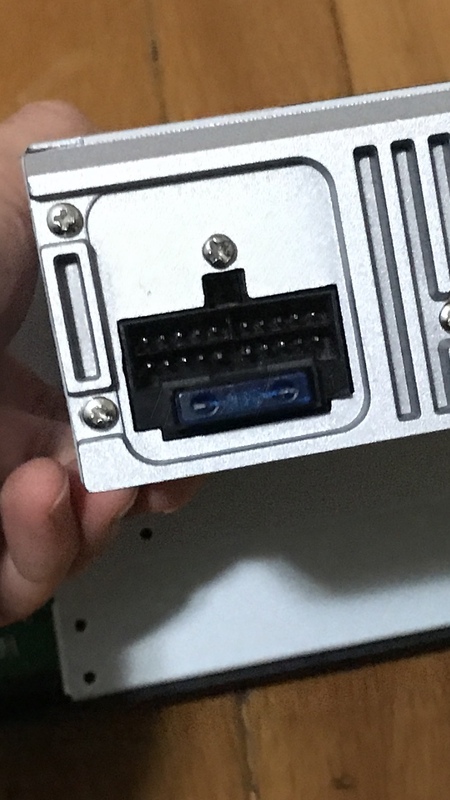 I am not sure all the android head unit pinouts are the same in their ISO connectors. No personal evidence of that but going off of listings for the extension cables they are careful to say they will only work with a certain android radio or group of radios. Can I skip the ISO-40 pin adapter and just run my long cable from the back terminating in an ISO connectore that I plug into the radio directly? Or you could forgo the additional harness and wire the long extension directly to the aftermarket radio. I think that is what you were describing in your previous post but was clarifying. That's what I was getting at in the above post. You can skip the 40 pin at the front for the head unit and wire the ISO directly to the extension harness. 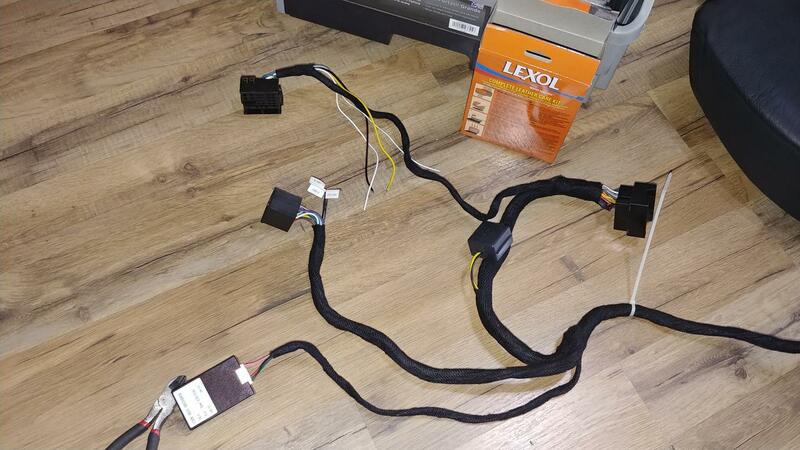 If you buy a head unit supplied with the extension cable... that's how it should come. My Avin 2 and the current Android unit came that way. Came with extra harnesses too, like the older style round pin harnesses in the rear as well as an extra pair of harnesses of each style which I can only guess is to retain the original radio unit in the back to keep OBC functionality? I cut all of that out of my harness though and only kept the 40 pin and canbus connectors at the back and left the front ISO termination alone. Can I skip the ISO-40 pin adapter and just run my long cable from the back terminating in an ISO connectore that I plug into the radio directly? In the below picture, it looks like I would lose CAN Bus connectivity, but do I need that if I have IBus connectivity? Yes, again, definitely skip the 40pin adapter up front if you want. 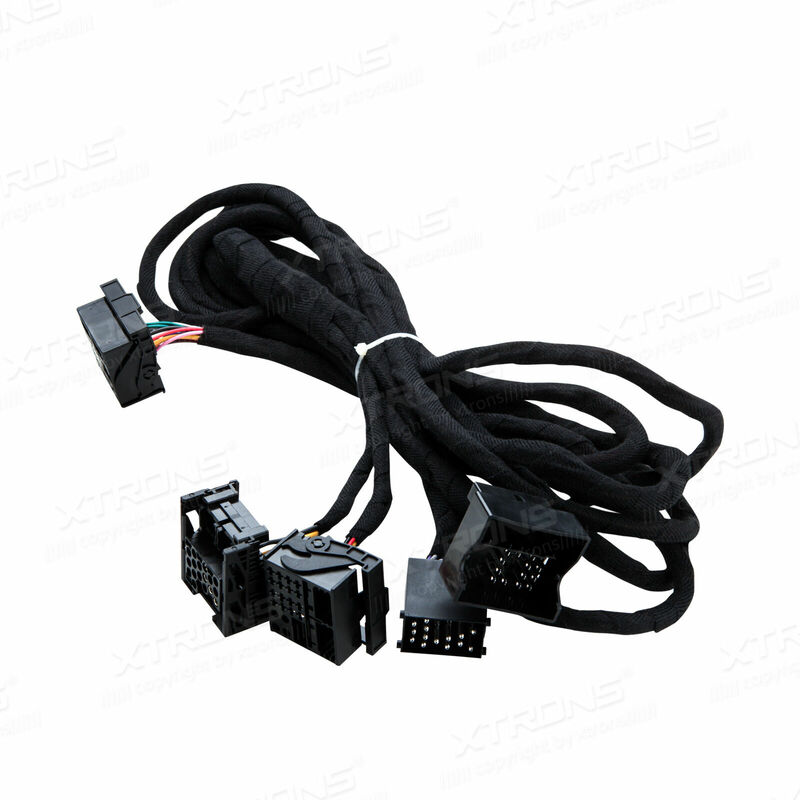 The harness I posted was designed to be used with a head unit that only supplied with a short quadlock to ISO connector. They figure the short harness supplied with your radio will have the CANbus on it. As to NEEDING CANbus because of having iBus... I don't know. I am going to have both connected in mine and just use the CAN signals for the radio and iBus for OBC and other functionality. If you are following Resler's iBus recommendations... run the iBus interface wires from the back up to the front along with your extension harness. I am going to use the nav unit's connections because at the time I read his instructions it did not recommend the rear connection method as being superior to other places to tap into the iBus signals. Okay, I just looked at what you ordered... is that ISO on both ends? Male and female? Did your radio come with a short (~12") quadlock adapter with canbus harness on it? If it did then all you have to do is combine the two harnesses. Cut the end off the one you want to go the rear and solder on the quadlock to connect to the OEM harness. Be sure to check pinouts stay the same though. I haven't ordered anything yet. The Eonon pictured above was just a good example picture of all the wiring. I'm trying to understand BEFORE I buy anything! So, it sounds like the ebay adapter pictured below will work fine for a simple generic radio if I extend it to the front and terminate there with an ISO connector. In the back of the truck, in addition to the quadlock connector pictured above, I'll need a canbus connector with wires running to the front dash area (or do they spice into some of the wires in the above connector or.... is the canbus connector under the dash even when all the other connectors are in the back?) I'll also need wire(s) to connect to IBus somewhere in the back that run to the front dash area to connect to the Resler IBus adapter (so the USB connection can remain a short wire). Last edited by Attacking Mid; 03-22-2019 at 04:28 PM. Does anyone know if there's a maestro iDatalink for E53? so I can still configure the car settings? Also does these android headunit support android auto? Some Android HU support Android auto - check the specs of the unit you are interested in. Xtrons is one brand that offers a 9" screen HU that has a steeper screen angle (as you asked in another thread) but there are other brands that offer this also - Seicane for instance. The Android HU are the best way to retain access tot eh OEM BC functions, via a USB iBus adapter and iBus app.